ATLANTA, April 21, 2017 /PRNewswire/ -- Aaron's, Inc. (NYSE: AAN), a leading omnichannel provider of lease-purchase solutions, and its divisions Aaron's and Progressive Leasing, surprised teens on Wednesday with a newly renovated Keystone Teen Center at the U.S. Bank Boys & Girls Club of Cincinnati. Aaron's, Inc., a leading omnichannel provider of lease-purchase solutions, and its divisions Aaron's and Progressive Leasing, surprised teens on Wednesday with a newly renovated Keystone Teen Center at the U.S. Bank Boys & Girls Club of Cincinnati. As part of Aaron's three-year, $5 million partnership with Keystone, which inspires teens to "Own It" by taking ownership of their choices to build the lives they deserve, Aaron’s associates have remodeled 20 Keystone Teen Centers across the U.S.
Keystone teen members of the U.S. Bank Boys & Girls Club of Cincinnati were surprised on Wednesday when associates from Aaron's, Inc., a leading omnichannel provider of lease-purchase solutions, and its divisions Aaron's and Progressive Leasing, unveiled a newly renovated Keystone Teen Center. As part of Aaron's three-year, $5 million national partnership with Keystone, Aaron’s associates have remodeled 20 Keystone Teen Centers across the U.S. Through a partnership with Boys & Girls Clubs of America (BGCA) and input from the teen members, Aaron's associates and Club officials worked on Monday painting, decorating and furnishing gaming, lounge and leadership programming spaces at the Club. On Wednesday, local Aaron's associates and Club officials unveiled the new space, which is now equipped with new technology, sectionals, tables and chairs, sound systems and fresh coats of paint. Teens chose the special Sherwin-Williams™ paint colors for the room: Heartthrob, Serious Gray, Black Magic and Alabaster. "The U.S. Bank Boys & Girls Club provides a safe and encouraging space for Cincinnati teens to achieve their goals and own their futures," said John Robinson, CEO of Aaron's, Inc. "On our 20th Teen Center renovation, Aaron's is proud to once again support the Boys & Girls Clubs of America by providing these teens with the resources and technology that will allow them to excel as leaders in their community." Cincinnati Councilman Wendell Young attended the surprise unveiling and addressed the crowd. "The Boys & Girls Clubs of America has occupied a special place in my heart ever since I accepted my first job with the Club many years ago," he said. "I grew up in Avondale and today, my wife and I still call this place home. Thanks to our community partners like Aaron's, members of the U.S. Bank Club now have a well-equipped space that will inspire them to work hard and chase their dreams." 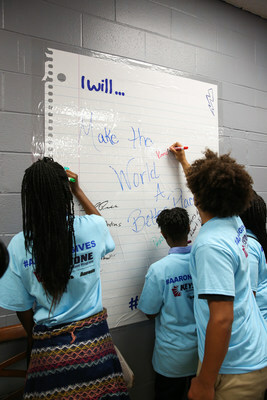 In 2015, the Aaron's Foundation, Inc. announced a three-year, $5 million national partnership with Boys & Girls Clubs of America's Keystone Program, helping teens develop their character and leadership skills in hopes of helping them reach their potential and creating positive change in the community. Keystone Club teen centers provide members ages 14-18 an environment to plan and participate in activities that focus on community service, academic success, career preparation and teen outreach. The 19 previous Keystone Club makeovers have included Boys & Girls Clubs in cities such as Los Angeles, San Antonio, Nashville, Las Vegas, Chicago and Miami. The makeover at the U.S. Bank Boys & Girls Club of Cincinnati includes an additional in-kind retail donation valued at $26,000. "Teens who participate in Boys & Girls Club programs see improvements in grades and graduation rates, preparing them for greater success as young adults," said Valarie Pollard, Club Director of the U.S. Bank Boys and Girls Club of Cincinnati. "With the support of Aaron's, which has provided a state-of-the-art space for our club with new technology, furniture and appliances, our teens will learn and develop the skills that lead to successful futures." Own Your Path: No matter where you come from, the future is yours to decide. Own Your Decisions: Making good choices opens more doors for your future. Own Your Community: Use your talents to make an impact in your community. To see photos of the Keystone Club remodel at the U.S. Bank Boys & Girls Club of Cincinnati, visit Aaron's on Facebook (www.facebook.com/aaronsinc), on Twitter (www.twitter.com/AaronsInc) and at www.AaronsGives.com. Headquartered in Atlanta, Aaron's, Inc. (NYSE: AAN), is a leading omnichannel provider of lease-purchase solutions. The Aaron's Business engages in the sales and lease ownership and specialty retailing of furniture, consumer electronics, home appliances and accessories through its more than 1,850 Company-operated and franchised stores in 47 states and Canada as well as its e-commerce platform Aarons.com. In addition, Progressive Leasing, a virtual lease-to-own company, provides lease-purchase solutions through approximately 22,000 retail locations in 46 states. Dent-A-Med, Inc., d/b/a the HELPcard®, provides a variety of second-look credit products that are originated through federally insured banks. For more information, visit investor.aarons.com, Aarons.com, ProgLeasing.com, and HELPcard.com. For more than 100 years, Boys & Girls Clubs of America (GreatFutures.org) has enabled young people most in need to achieve great futures as productive, caring, responsible citizens. Today, more than 4,100 Clubs serve nearly 4 million young people through Club membership and community outreach. Clubs are located in cities, towns, public housing and on Native lands throughout the country, and serve military families in BGCA-affiliated Youth Centers on U.S. military installations worldwide. They provide a safe place, caring adult mentors, fun and friendship, and high-impact youth development programs on a daily basis during critical non-school hours. Club programs promote academic success, good character and citizenship, and healthy lifestyles. In a Harris Survey of alumni, 54 percent said the Club saved their lives. National headquarters are located in Atlanta. Learn more at www.facebook.com/bgca.clubs and https://twitter.com/BGCA_Clubs.